This intermediate course is an accredited module for students with some experience of drawing. The course will explore traditional and contemporary drawing. This intermediate course is an accredited module for students with some experience of drawing. The course will explore traditional and contemporary drawing. It aims to expand the students’ knowledge of drawing using the life model and other observational drawing exercises. The course will introduce various media including pencil, ink, and charcoal as well as basic techniques such as perspective, anatomy, proportion, tonal understanding and mark making. It will also introduce the participant to basic research and how to develop a sketchbook practise. Applicants should have basic drawing skills and familiar with basic drawing terms. Assessment is optional and can be discussed with the lecturer. Some homework is expected and the course is suitable for those who wish to add to their drawing practice. Semester 1 October to December will be bridging studies leading to the module itself in Semester 2 January to March. Helle Helsner has been teaching life drawing in Crawford College of Art and Design since 2000. She graduated from the College in 2001 with a master by research in pre historic casting techniques and thus also comes from a sculptural back ground. Drawing and sculpture are integral parts of her art practice and the two are often combined. Helle explores drawing on a daily basis and is not restricted to figurative drawing. She uses nature or urban setting just as often. Her work is contemporary, fast and intuitive with an exploratory side combining materials, techniques and mark making. Helle has facilitated various workshops in Ireland, USA and Europe and her work can also be found in both private and public collections in Ireland, USA and Europe. The life drawing classes began as a hobby and developed my art practice into a career. If I had not taken the two hours out of my busy week I may still be stuck working in a field I was not happy in. These classes were the catalyst for my path in becoming a practising artist. The class was intimate and intense with a great feeling of achievement at the end of each week. I would highly recommend anyone who may think they could have a flare for art to take the leap and start their own journey. 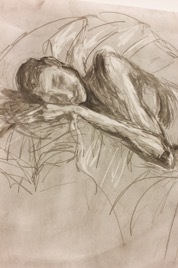 I started the 20 week course in life drawing with Helle Helsner and by week 10 I had applied through the CAO for a degree in Fine Art in Crawford College of Art and Design. I went on to complete my degree, receiving three awards after graduation. This led on to studying the MA Art and Process in Crawford which I completed last January. All courses will run subject to minimum enrolment.